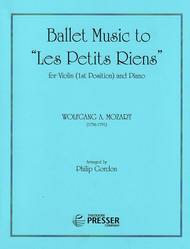 Ballet Music To "Les Petits Riens"
Ballet Music to "Les Petits Riens (For Violin (1st Position) and Piano). Composed by Wolfgang Amadeus Mozart (1756-1791). Arranged by Philip Gordon. For Violin Solo, Piano. Solo part with piano reduction. Standard notation. 4 pages. Duration 2 minutes, 45 seconds. Published by Theodore Presser Company (PR.114402940).With Standard notation.